January is naturally a time of year when we start to look forward. There are expectations of the year ahead, and promises to be made to ensure that this year really will count. As a result of looking ahead we also tend to look back at the year that’s just passed as well. Hindsight is a fantastic thing to learn from – both because we can increase that which made us happy, and hopefully learn from and decrease what made us unhappy. However tempting it is to make plans at the start of the year, I do think that making resolutions in January can be a recipe for disaster, as we are putting extra pressure on ourselves to make sometimes drastic changes to our lives at a time when we are just getting back into the swing of a new year, back to school and work, and the weather is miserable. As such, I wanted to wait until we were a couple of weeks into the year before I wrote anything about setting goals for the year – and I wanted to explain my method for setting goals, so that you may get some inspiration for anything you want to achieve over the coming months. As much as I think it is vital to have goals in life – big or small – it is just as vital to time these goals so that they help rather than hinder you. Over the years, I have tried various times of year to do this, and as such I have come up with a pretty clear way to get more done and not add too much pressure to the mix while trying to do so. I like my year to track the school year as closely as possible – and so I tend to start my year in September. This is the most productive 3 months that I have as I really do get that “back to school” feeling. Just back off the summer holidays with lots of ideas and plans to implement. Perfect! Winter is next – and of course with December being the first of these months, this is a less utilised month for me as there are school holidays, lots of commitments, and generally it’s unrealistic to plan too many extra things into my time as I have to be honest that they just won’t get done and I will get disheartened. I basically give myself a break and use the month to tie the year up and start thinking about the new year. This gives me a whole month to look at what’s important to me for the new year – and I feel less stressed as a result. January then comes and I again give it a couple of weeks to settle back into the usual routine after Christmas, and then have a good 6-7 week block to achieve some great goals for the start of the year. Spring is another key time of my year for getting larger projects done as it is a long stretch of time, the weather is warming up and I feel much more energised. Easter is during this time, which allows a little break, but it’s never the same sort of down time that we get over Christmas or the summer. Lastly – summer. As with December, I usually discount August in my planning as this is the time when my daughter is off on her school holidays, we tend to go away as a family, and generally things are on “go slow”. As such I get as much packed into June and July as possible as I know that August will be a time to relax and catch up a little. Having 2-3 months in each block of time (around 100 days) where I can set goals means that I can really focus on the season I am in – and plan a realistic amount of work/goals for this time. It’s also a lot easier to look ahead at the next 8-12 weeks, whereas planning for a whole year can seem really daunting – not to mention that things may drastically change over the course of the year and plans would have to be altered accordingly. Lastly – I really like how you feel you are always moving forward with things, and you create more momentum this way. As I don’t tend to implement any of my goals in December, this is still the perfect time to get started and see how it works for you. There is a good block of 6 weeks to be had – and so much can be achieved when you focus on just the 6 weeks ahead of you. – it’s not so daunting! Start by writing down all the things you would like to achieve this year. Really brainstorm it – and think of all aspects of life (you don’t want to focus on one area as this may make the others suffer – for example wanting to get fit is fantastic, but if you then spend every day in the gym you may not be able to spend as much time with your family, or on work, or on other hobbies etc….). I wrote a post a while back on living a balanced life which you may want to take a look at as it makes you think about each of the 5 main areas you have. TIP – Think where you want to be in a year in an ideal world, and work from there – whether the change is small or big. Work out a rough timeline of when you want to get each thing done by – and start to split them up into the right season. For example – because Spring and Autumn are the 2 seasons where there are less holidays and down time, I like to plan my bigger work projects at these times, and then tackle some smaller things in Winter and Summer. You need to work with the times that suit you best as you are much more likely to stick with the plan if you do it like this. TIP – Is it do-able? Don’t try and fit in too much as you will just feel awful when you inevitably fail as you have set an impossible task – push yourself but only allocate time to what you realistically can achieve. Now you should have a rough overview of the year – but the beauty of this way of doing things is that now you know that everything should be tackled in whichever season you have allocated it to, you can just concentrate on the season you are now in – which for now is Winter. Take each goal – or one goal if you only have one – and split it up into chunks of work. For example – if you want to redecorate a room then give yourself the end date of Feb 29th (leap year!) and work backwards from there. That way you can have a deadline, and steps to get there. This automatically does two things – gives the project/goal some impetus and gets you motivated, and also shows whether the deadline is possible. It sets expectations, and stops overwhelm as you can spot any timing issues right at the start. There are so many things that you could include – it could just be one major thing or several small ones – whatever you choose you can get really focused and achieve so much. So – what do you want to achieve this year? 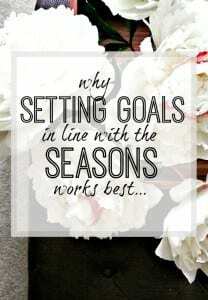 I’d love to know whether you like the seasonal idea of setting goals rather than setting new years resolutions for the whole year, and if you want to share your goals then please write a comment below as I’d love to know what you are planning – it can be really helpful to put it out there as it becomes much more real then!